Summary: In all, Good Night, And Good Luck is a must-see film. 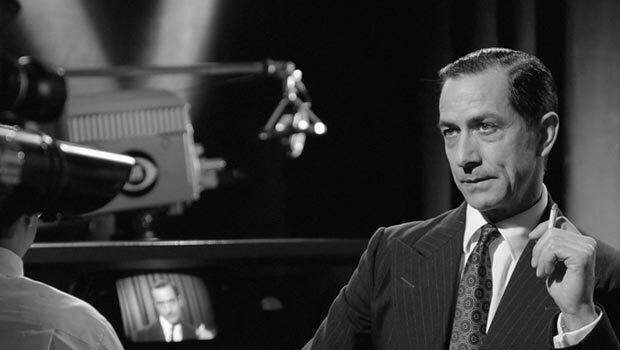 Set in the smoke-filled, coffee fuelled early days of US broadcast journalism (no change there then), Good Night, And Good Luck is the true story of how CBS news anchor Edward Murrow locked horns with the Communist witch hunts of Senator Joseph McCarthy – and won. The action begins in 1953, when Murrow (David Strathairn) and producer Fred Friendly (George Clooney) hit on a story about the sacking of a “Commie” Navy pilot without trial or justification. Refusing to take advice from the executives, or indeed gentle threats from the US military, Murrow and his team put everything on the line as they collide with McCarthy and his House Of Un-American Activities. As his second directorial feature, Good Night, And Good Luck is about incidents very close to George Clooney’s heart. His father, Nick, was a news anchorman for some 30 years, and George was a mere five when he got to look around onto his first studio floor. This being the case, the towering figure of Edward Murrow was considered a legend and an icon in the Clooney household; for Nick Clooney, Murrow was the paradigm of virtuous broadcast journalism and the benchmark for which all journalists should be striving. So it follows that Clooney felt compelled to tell the story of Murrow’s career-defining moment; he co wrote the screenplay with co-star Grant Heslov, took the role of loyal producer Friendly and directed the film himself. It is only reasonable to assume then, that our George had a lot riding on making this film a success. Well, fortunately for him, his dad, Mr Murrow and everyone else, he has achieved this with bells on. Shot entirely in black and white, Clooney has crafted an intimate and compelling little film that has a great deal to say about the role television should play, as the most powerful medium on the planet, when it comes to informing people on the truth. Clooney’s directorial debut, Confessions Of A Dangerous Mind was a solid, if overly styled piece of whimsy, but his follow up is much more of a sharp-toothed beast. Boasting excellent performances from everyone involved, the film is an assured polemic against the many injustices brought on the innocent by bullyboy politics. Clooney himself gives a reserved but solid performance as Friendly – far less quirky head ticks and charming smiles going on here than normal – and there are other performances also worth mentioning. Robert Downey Jr and Patricia Clarkson give great support as work colleagues who are secretly married – a status outlawed when working professionally together by NBC at the time – while Frank Langella also delivers an excellently authoritative performance as NBC bigwig William Paley. Admittedly the films relatively short running time of 90 minutes doesn’t give these supporting roles enough time to breathe as the collective talent on display deserves, but really this film belongs to two men: Murrow and McCarthy. As Murrow, Straithairn is nothing short of spectacular. Rarely off the screen, he gives an electrifying performance of almost unparalleled authenticity. Whether or not he gives an accurate impersonation of the real Murrow is not for this writer to comment, but with his lean but grizzled appearance and distinctive voice and delivery, it’s like they took a news anchor from the fifties and CGI’d him into a modern film! Whether he’s presenting news show See It Now or nervously awaiting the fallout from one of his excellently written closing sign offs, Strathairn is absolutely hypnotic. This relatively unknown character actor has been nominated for the Best Actor Oscar this year, and even though it will probably go to either the (admittedly deserving) Philip Seymour Hoffman for Capote or Mumbles Ledger for that glorified TV movie about cowboys, it will be a crime that Strathairn’s performance is not justly recognised for everything it deserves. As for McCarthy, it is a masterstroke that Clooney decided to entirely use real archive footage of this bullish and cowardly political figure. If an actor had been used, the audience probably wouldn’t have been convinced by the performance, as the real-life words and actions of McCarthy beggars belief. Like Murrow, Clooney has felt compelled to let the truth speak for itself by presenting events as they actually happened. Seeing McCarthy’s recorded interrogations and subsequent responses to Murrow for real, this only gives the film another layer of authenticity. Clearly there are the obvious parallels with what happened in America during the fifties and the current political climate under the Bush administration, but this film also concerns itself with broader themes, such as professional integrity, honour and allegiance, not to mention the ultimate control the people with money have over just about everything. The actions of Murrow and his team directly led to the public shaming of McCarthy and the termination of the House Of Un-American Activities, but as the film clearly shows, this victory did not come without a price. In all, Good Night, And Good Luck is a must-see film. More resembling a play, with almost all the action taking place in one claustrophobic set, the film slowly draws the audience into the drama with utter conviction. Loose, semi improvised scenes truly capture the frenetic energy of a newsroom, and add to the quiet intensity of the proceedings. Also, this is one of those films that makes smoking look impossibly cool, which was rather frustrating for this ex-smoker. Actually, even if you don’t smoke, I guarantee that the first thing you’ll want to do when you leave the cinema, other than feeling hugely satisfied by this gem of a movie, is light up!